Scientific Name: Echis carinatus. Other Common Names: Carpet viper; “Phoorsa”. All over India (especially plains and deserts). · The saw-scaled viper is a small snake, about 1½ to 2 feet long, and is usually brown in colour (Fig 12.7). Occasionally, the colour appears greenish. There is a wavy white line along the entire length of each flank, while diamond-shaped markings extend over the back, numbering usually 25 to 30. · The head is triangular with small scales. A characteristic whitish, arrow-shaped or crow’s foot mark is often present on the head. The pupils are vertical. · The saw-scaled viper is named as such because its scales are serrated. When agitated, it throws itself into a double coil (in the manner of a “figure of eight”), and rubs the coils together vigorously, producing a harsh, rasping sound, akin to the sound of a sandpaper being scraped over a rough surface. At the same time, it also hisses loudly by exhaling forcefully through the nostrils. 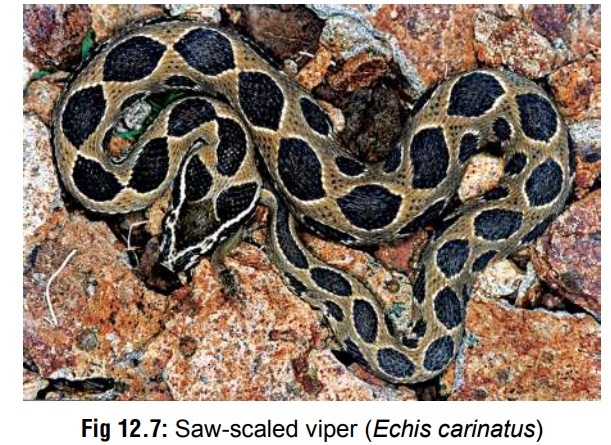 · Like other vipers, the saw-scaled viper is viviparous. The echis is an aggressive snake and may bite on the slightest provocation. · This snake prefers desert regions, and is often found basking in the sun during the daytime, among rocks or in sandy soil. It may enter human habitations especially tents, in search of prey. In some parts of peninsular India, it is very uncommon, particularly in most parts of Kerala.